The Religious Brothers Conference (RBC) is a service organization that welcomes Brothers from the monastic, contemplative, missionary, and apostolic traditions. The mission of our organization is to promote the call to religious Brotherhood as an essential and fulfilling vocation for men within the Catholic church. We encourage all Brothers to live the Gospel message in a prophetic while honoring the charism and tradition of their particular institute. The roots of the RBC begin in the mid 1950’s. THE MISSION SECRETARIAT, an organization encouraged by the Society of the Propagation of the Faith was established in 1954. The Mission Secretariat was a gathering of the Mission Sending Societies of the United States from both the men and women’s congregations. At that time, Bishop Fulton Sheen was the Director of the National Society for the Propagation of the Faith and Director for the Mission Secretariat. Father Frederick McGuire CM, served as the Executive Director, and Brother Hillary Mettes, ST was his assistant. Both men worked together in facilitating the Brothers becoming part of the Mission Secretariat. The work of this organization was conducted in the style of group conferences with one such designated group being “Educators and Non-Teaching Brothers.” By 1955 a significant number of Brothers began attending indicating the general interest in the place of the Brother in the United States Church. In fact, this was the first national gathering of Religious Brothers in the U.S. 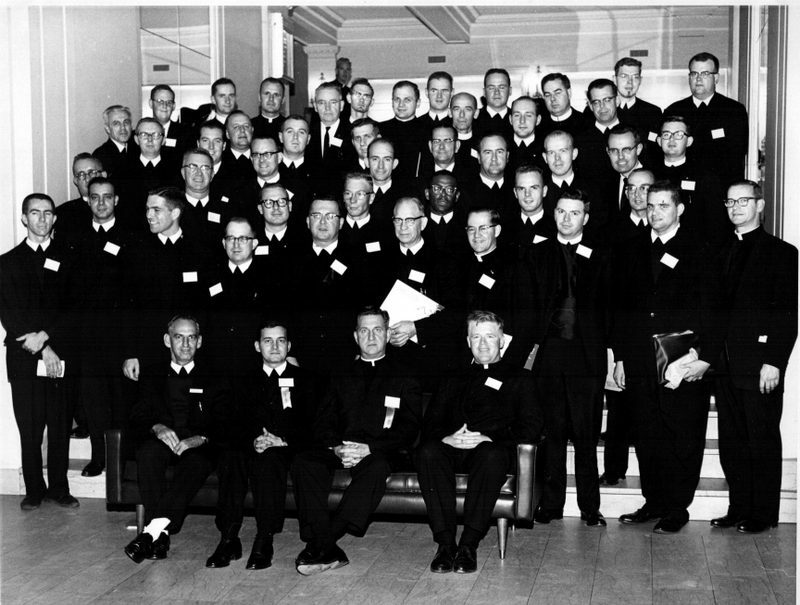 In 1956 Brother Damian Carroll, CP was invited to Co-chair the Brothers Conference and by 1957 the Brothers were in the position of running these meetings by themselves. In 1959 Pope John XXIII surprised the Church by announcing the the Second Vatican Council which began in October of 1962. During the 1965 Annual Meeting of the Mission Secretariat, the Brothers made the decision that it was time to move out on their own. There was a general feeling that the Mission Secretariat had fulfilled its purpose. 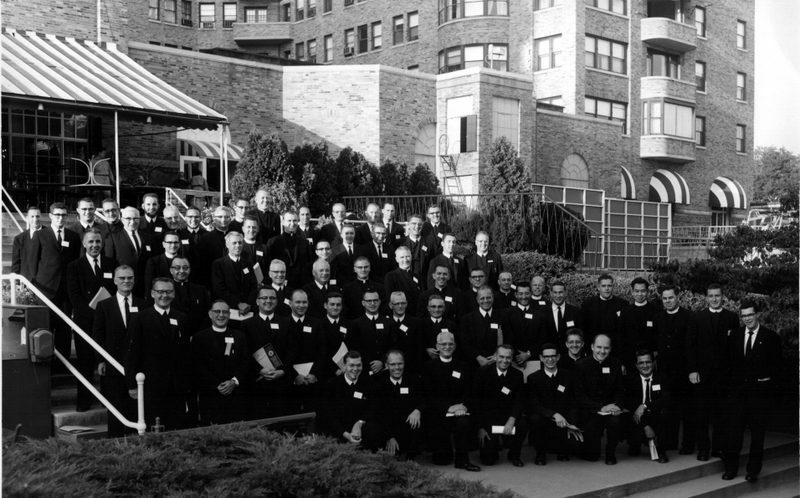 In the summer of 1966 the Brothers made the decision to establish the RELIGIOUS BROTHERS INSTITUTE. The Brothers Newsletter became its official publication. For the next six years these Annual Institutes were held at various parts of the country. The first Institute was held at the Salvatorian Retreat Center in Blackwood, NJ; other sites included Stonehill College, North Easton, MA; Wheeling College in West Virginia; two institutes were held at St. Joseph’s College, Rensselaer, IN and the final one was held at LaMoyne College in Syracuse, NY. 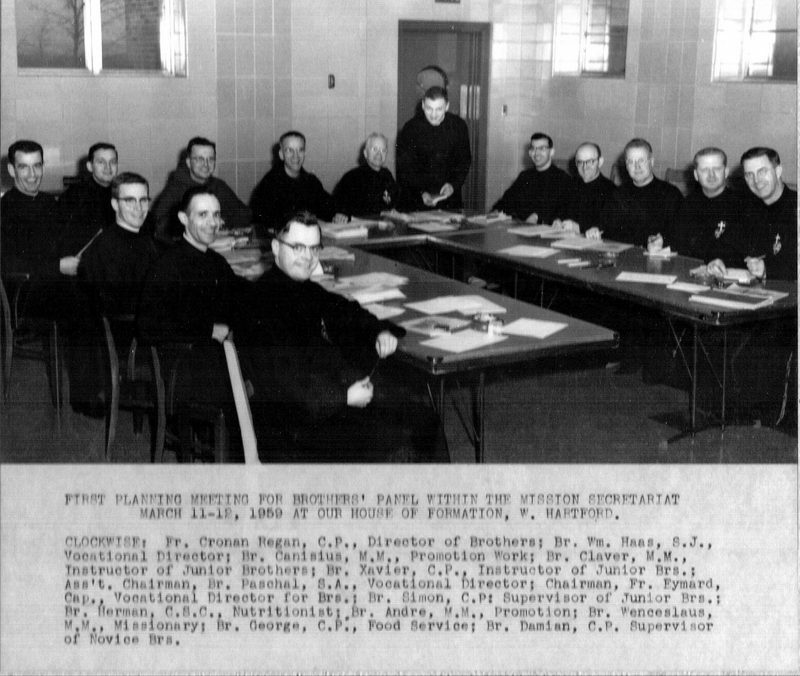 During those years it was often suggested that we have a more formal organization and during the 1971 Brothers’ Institute a steering committee, chaired by Brother Sean McLaughlin, SDS was formed. As a result of the deliberations of this committee Br. Sean presented a formal proposal to establish the National Assembly of Religious Brothers (NARB). This proposal was voted on and it passed unanimously. It is important to note here that during the previous seven years the annual meetings of the Brothers at the Mission Secretariat and with the Brothers’ Institute were organized by Brother Damian Carroll, CP. For that reason, Br. Damian is recognized as the lead force in founding and establishing NARB as an organization. 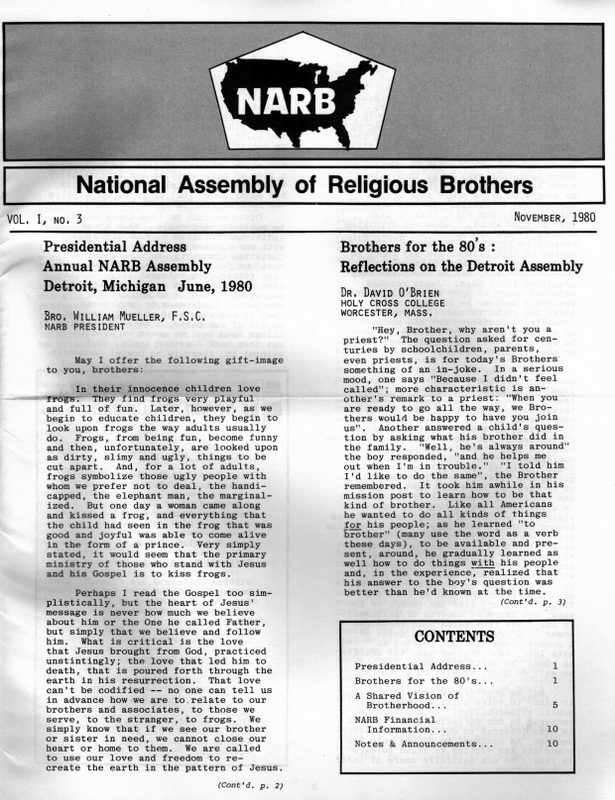 The first NARB Convention began on April 4, 1972. This first gathering was a constitutional convention and it was held at Columbiere College in Clarkston, Michigan. 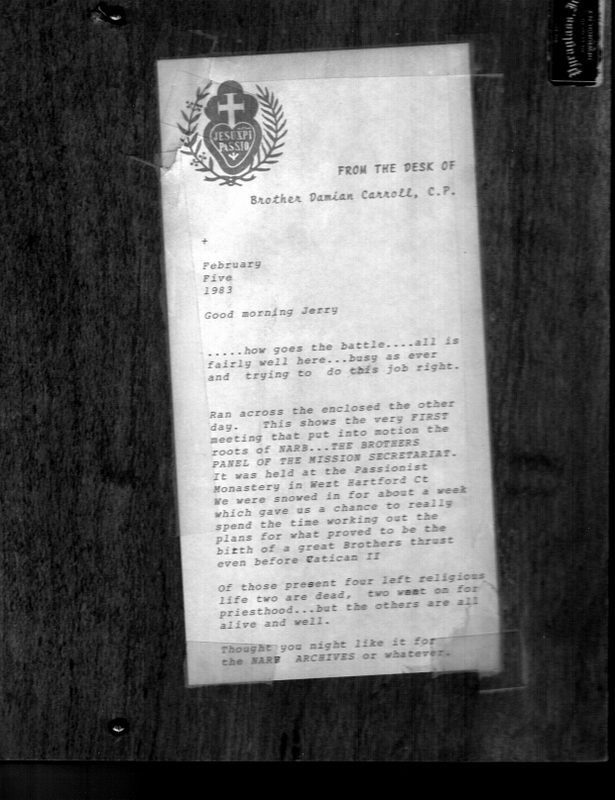 The presence and strong support of John Cardinal Deardon and the President of the Conference of Major Superiors of Men, Father Paul Boyle, CP; the President of the National Assembly of Religious Women, Sister Ethna Kennedy; the President of the National Conference of Priest’s Councils, Father Frank Bonnike was encouraging. The Keynote address was given by Brother Robert Francoeur, FIC then President of Walsh College, Canton, Ohio. On the closing day of this first NARB Convention the first officers of this new organization were elected: Brothers Bonaventure Scully, CFX, President, Raymond Saville, SA, Vice President, Damian Carroll, CP, and Treasurer-Secretary. Following this election the members of the new Board were also elected. Those elected were Brothers Guy Roddy, FIC, Gerald Selenke, SCJ, Patrick Sheehy, SJ, Robert McCann, FSC, Sean McLaughlin, SDS, Richard Smith, CSC, Charles St. James, FIC and Gerard Meegan, SDB. Over the next twenty-five plus years, NARB continued to grow and experience success as a grass roots organization. During that time NARB sponsored numerous and successful activities. In 1997-1998 the Board began to look at the organization and the direction that it may need to move towards. They consulted with provincial leaders, members, and various other colleagues in ministry. What was made clear to the Board at that time was that an organization “for and about” Brotherhood was necessary. However, the direction of the organization needed to reflect the contemporary Church and the challenges Brothers were facing since Vatican II. In essence, the Board was reminded of the words of Sister Clare Fitzgerald who claimed that “the sin that we religious can commit today is to try to perform the tasks of another time.” The Board then worked to clear the way for a new organization to take shape. It was a different time and a different Church, with different needs. The NARB Board started conversations in 1999 concerning the future of the organization. At a special meeting held at the Edmondnite Retreat House on Enders Island this concern took on greater importance. It was at this meeting, that the Board made the decision to move forward with the new significance for the association. 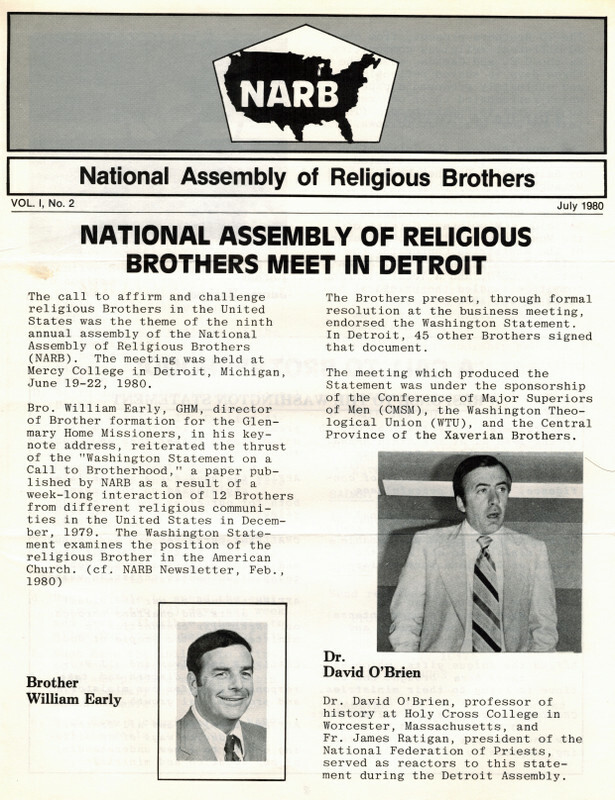 In 2000 NARB changed its name to the “Religious Brothers Conference” (RBC) in order to reflect this new direction and to move beyond NARB’s tasks of the previous decades. The challenge for RBC today is to look address new realities facing Brothers in the Church. A primary focus of the RBC’s mission is to promote the Brother’s vocation and to educate the Church about lay religious life for men. In July of 2014 the RBC will celebrate its 43rd Annual Assembly in New Orleans. The RBC is already planning events to coincide with the Year For Consecrated Life that will begin in October 2015. And pre-planning for the 2016 assembly is already underway. The Religious Brothers Conference (RBC) is a service organization in the Catholic Church. The Mission of the RBC is to promote the Brother’s vocation. We encourage all Brothers to live the Gospel message in a prophetic way while honoring the charism and tradition of their particular institute. We are grateful to Brothers like Damian Carroll, Bob McCann, Adrian Gauidan, William Brown, Bonaventure Scully, Sean McLaughlin and so many others who helped to envision and create an organization that Proclaims Brotherhood. This article was summarized by Brother Stephen Synan, FMS. Conversations with Former and Present RBC Board Members.